The third in CBC Toronto's series: Gridlock City. Today we look at how technology can improve and update traffic infrastructure and improve travel times. Corinne Herman's drive through downtown Toronto often produces frustrating results. Read and watch stories from CBC Toronto's special series looking at the challenges facing GTA commuters. 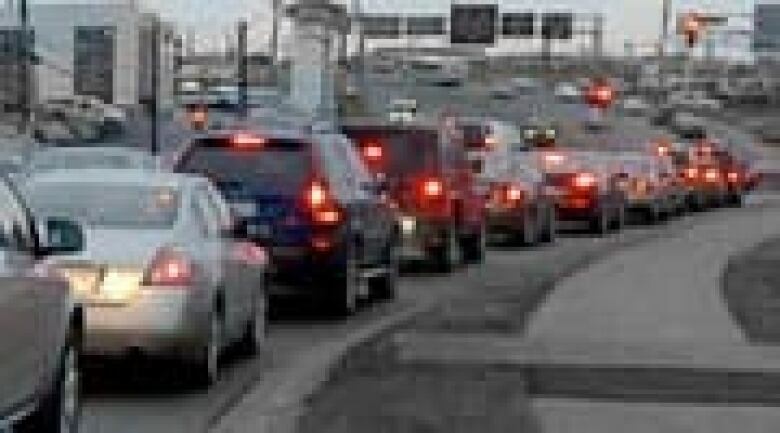 Jan. 17: One way to solve congestion? Jan. 18: Live chat replay: Solving Toronto's gridlock. "I hate the traffic infrastructure and the traffic light cycles in the city," she says. "They don't seemed timed very well. There definitely doesn't seem to be a very good flow." Solving her frustrations is what Professor Baher Abdulhai is hoping to do. He's with Intelligent Transportation Systems Centre at the University of Toronto. "Everybody realizes that we have a big congestion problem in Toronto and the scarier part is that it's getting worse, exponentially." One of the solutions he's working on: smarter traffic lights using artificial intelligence to control the flow of traffic. "Each traffic light would learn how to time itself, like green and yellow and so on and switch from a phase to another based on the actual traffic it sees and senses along the approaches to that intersection." The new part, he says, is the lights would communicate wirelessly with nearby intersections to make sure they're working together to move traffic along. "They play a game and negotiate with each other to come up with an optimal plan for the local conditions at a given traffic light but also taking in to consideration the neighbouring traffic lights," he says. The results, he says, are very significant. In computer simulations, they tested an area of downtown bounded by Bathurst Street, Front Street, the Don Valley parkway and Lake Ontario. Using their software, he says they found the average delay was reduced 40 per cent. In some key intersections, Spadina and Bremner for example, he says delays were down 60 to 70 per cent. "It's better for the environment, better for overall travel time but very very significantly better at intersections themselves." Currently in Toronto, about 15 per cent of the city's 2200 traffic lights use a system called SCOOT. Using sensors embedded in the roads, it adjusts the timing of the lights based on traffic patterns. It's connected to the city's central traffic command centre. The technology is about 20 years old and is showing its age. The city is currently undergoing a year-long review of the system. Right now the city hasn't expressed interest in the system saying the technology still needs to be proven. The proving ground for the technology could be a business park in Burlington. Transportation planners there are looking at the technology to solve congestion at the intersection of Walkers Line and Harvester Road. Rush hour congestion from the surrounding offices had officials considering an $8-million re-build of the intersection. Abdulhai and his team stepped in and showed their system could achieve improvements in traffic flow similar to the construction, but without the mess, and for a cost of about $200,000. Burlington's Director of Transportation Services Bruce Zvaniga calls the results of the simulations there "promising," but says its no silver bullet that would eliminate all congestion all together. He also notes there is a long time between the research phase and an on-street trial. Over the next six months, Abdulhai is working with Burlington, testing the technology in the lab using real-world hardware. He hopes the results will lead to field tests and encourage other municipalities to look at the technology. "It needs a champion, it needs the mayor of Toronto or the city of Toronto, to say, let's at least field test this on a small number of intersections and see if it does what it promises to do."